Welcome to St. Thomas, Fr. Michael! Michael Hoyt was born on June 14, 1974 as the sixth of nine children of Dan and Judy Hoyt. He grew up with his four brothers and four sisters at 57th and Washington Blvd. in the heart of the Meridian-Kessler neighborhood in Indianapolis, Indiana. He and his siblings all attended Immaculate Heart of Mary Catholic School (K-8), Chatard High School and Ball State University. After his freshman year at Ball State, Father Michael put his Eagle Scout experience to work at Yellowstone National Park where he served as an intern ranger and then again in Colorado, Utah and Wyoming during his sophomore year. An avid outdoorsman, he earned college credit while winter camping and kayaking in 20 degrees below zero temperatures. During the spring of his junior year, he traveled abroad for a semester of studies in London. It is here that he started asking life’s big questions. He started going to church again and decided that he either needed to commit fully to pursuing a relationship with God or not. He decided that he indeed needed a relationship with God and that he needed a religious community to do it. Having decided to fully commit, he traveled to Boston to visit the Oblates of the Virgin Mary. After joining the order, he subsequently transferred from Ball State to St John’s seminary to deepen his understanding of Catholicism and Christianity. He grew in his faith but wanted something more radical and community based, so after finishing his General Studies degree through Ball State in the Fall of 1996, he joined the Brothers of St. John in Laredo, Texas, which he describes as a young, idealistic community that was founded in France in 1975. He left for Texas not knowing what would be in store for him. He was leaving his old life behind. Father Michael’s first couple of months in the order were difficult, but after a couple of months, his parents came to visit, and he felt much better about his decision. In the spring of 1997, he was told that he needed to learn how to speak French. So, off he went to France and within a year, he became a proficient French speaker. When he moved to France, he did so not knowing when he would come back. He ended up staying for three years, studying philosophy and making his simple vows of poverty, chastity, and obedience. After his experience in France, he was called back to Laredo where he spent two years learning more about his faith and community in an internship. He dreamed of going to India. He felt that he had a calling to go there. “Brother Mary David” as he was named had a new religious habit made and blessed and was ready to go to India to serve. Alas, he was assigned to another year in Laredo as head of the retreat center. After Laredo, he was sent to Princeville, Illinois where he served as the vicar (the house manager) of the newly constructed novitiate (the house where young men enter the religious life). The following year he was sent back to France for four years. While there, he studied Theology for three years and in 2005, he was ordained a priest in Vezelay, France at the beautiful Basilica of St. Mary Magdalene. His first priest assignment was in Souvigny where he served as a sacramental ministry in the parish and vicar of the house. As he puts it, communal living was “difficult but beautiful” with the six other brothers there. He feels that this was a very providential time in his life. Jesus was the good shepherd to him as he contemplated his future. He decided to visit his friend, who was the chaplain at the University of Illinois – Chicago. He became associate chaplain at the Newman Center and lived at St. Giles Catholic Church in Oak Park where he provided sacramental assistance to the parish. At the end of the spring semester that year, he was still on a quest. He asked for a sabbatical to pursue a masters in social work, which he did at the University of Illinois – Chicago during 2010-2012. By 2012, he discerned that he was called into diocesan ministry, something he never thought he would do. He began the process of incardination (he was coming from an order into an archdiocese), which takes about 3-5 years. The process of incardination took four years and he became formally incardinated in October, 2016. 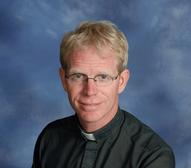 During that time, he served as associate pastor at St. Malachy in Brownsburg for two years (2012-14) and then was sent to St. Michael’s as pastor for three years. Although leaving the people of St Michaels has been sad for him, Father Michael is looking forward to listening to, learning from and journeying with the people of St. Thomas Aquinas parish. He feels called to be a servant leader and wants to communicate the love of Jesus Christ to us through his words and actions. He says, “Life as a priest is about being in relationship with Jesus Christ and our brothers and sisters. Loving Jesus and bringing Jesus to all is what gives life purpose and meaning.” He wants to build on the 75 plus years of that here at St. Thomas Aquinas. He will also be the catholic chaplain at Butler. Also, Fr Michael is the chaplain for the French speaking catholic community of the Archdiocese. The French speaking community meets regularly for various events, the main event being the monthly Mass in French, which is now held at our parish. He also will continue to preach in various religious communities in Indianapolis. Fr Michael is grateful to Jesus for having called him to serve at our parish. He is excited about being a part of such a wonderful, historic and meaningful community. With his return to the neighborhood, he is happy that his parents and some of his siblings will get to be a part of our parish family.